I visited Egypt in 2018 and I was blown away by all of the incredible things to see and do there. This is a country full of ‘bucket list’ experiences. The most famous thing to see in Egypt would easily be the Great Pyramids of Giza near the capital city of Cairo, but there are also some other ‘must see’ sights in central and southern Egypt. These include the archaeological museums and temples of Luxor, and the incredible pharaoh statues and ancient tombs at Abu Simbel. Hopefully these pictures of Egypt inspire your travels! Abu Simbel is my favorite monument in Egypt. This is an incredible ancient temple dedicated to Pharaoh Ramesses II and Queen Nefertari. Of course you don’t want to miss the Great Sphinx! This can be seen on a trip to the pyramids. The inside of the Abu Simbel temples is just as incredible as the outside. Egypt may not be known for scenery, but it does have some interesting landscapes. The Egyptian Museum in Cairo is loaded with incredible artifacts from ancient Egyptian history. These are authentic pharaoh figurines on display at the Egyptian Museum. The museum also has lots of impressive gold artifacts like this one. These are two statues guarding a doorway inside the Abu Simbel temple. Egypt is full of interesting temples like this to explore. Seen here: Hobu Temple. I love the expression. This camel looks way too happy about being at the pyramids. These are some of the ancient inscriptions you can see in the Abu Simbel temples. The Great Sphinx is the oldest surviving sculpture in Egypt. It’s going on 5,000 years old. Let that sink in for a minute! One highlight of my time in Egypt was seeing King Tut’s gold mask and other items at the Egyptian Museum. The incredible Pyramids of Giza belong on any traveler’s bucket list. How amazing is it that places like this still exist? 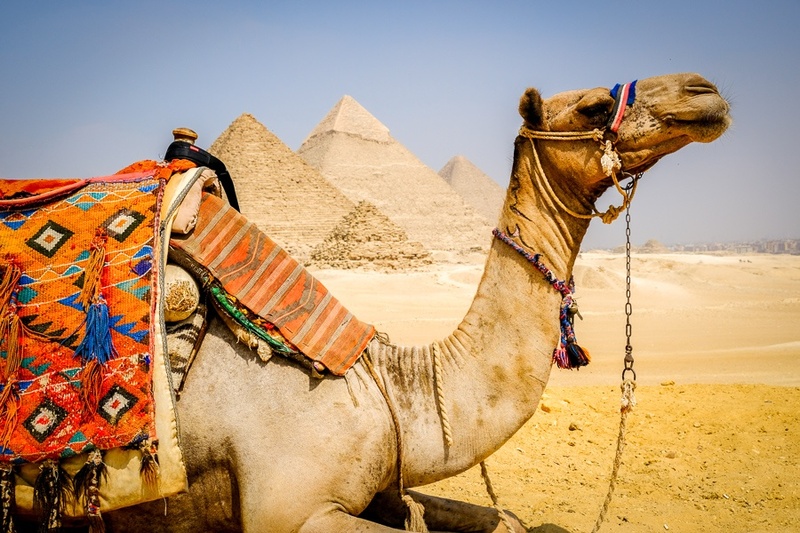 Camel rides at the pyramids are very fun and very affordable! These inscriptions were carved 3,000+ years ago. It doesn’t seem real. The Temple of Hatshepsut is another incredible spot near the Valley of the Kings in Luxor. This was officially one of the nicest camels I met during my time in Egypt. Camel ride at the pyramids! This was a great experience; one of the highlights of my trip to Egypt. You can see this big statue of Rameses II at Karnak Temple in Luxor. Seeing the pyramids up close like this is a must. The Abu Simbel temples were built in 1244 BC to celebrate Rameses II’s victory at the Battle of Kadesh. The Pyramid of Khafre is massive, but it’s only the 2nd largest of the Giza pyramids. The Hypostyle Hall of Karnak Temple is absolutely mindblowing in scale. The roof may be gone, but the huge columns are still here! Passing a conga line of tourists on camelback near Giza. Coincidentally, I took this pic while also riding a camel myself and trying my best to keep the camera steady. Sunset at the pyramids is a sight to behold! This is a picture I took from my hotel rooftop. This is yet another cool statue of Rameses II, but this one can be found at Luxor Temple. Seeing these incredibly massive pharaoh statues at Abu Simbel is a bit like wandering back in time. The only thing more amazing than seeing these huge statues in the day time, was seeing them lit up at night. It was the highlight of my trip to Egypt, and probably one of the best travel moments I’ve had anywhere in the world.